FILE - President of Mauritius Ameenah Firdaus Gurib-Fakim speaks at a summit on water issues in Budapest, Hungary, Nov. 29, 2016. 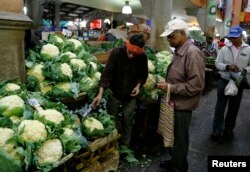 FILE - A vendor shows vegetables to customers at the market in Port Louis on the Indian Ocean island of Mauritius, Aug. 5, 2015. 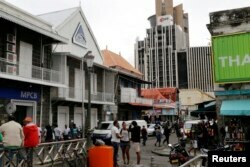 FILE - A view of the Commercial Bank of Mauritius office, left, in Port Louis on the Indian Ocean island of Mauritius, Aug. 5, 2015. 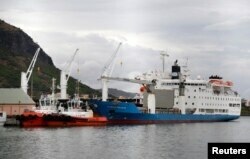 FILE - View of the harbor of Port Louis on the Indian Ocean island of Mauritius, Aug. 5, 2015.